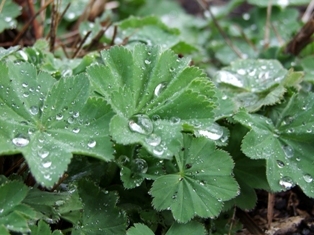 Joy Creek Photo Archive (c) all rights reserved Alchemilla mollis is a clump-forming perennial that stays mostly evergreen in our gardens. Billows of tiny yellow flowers adorn this over a very long time. Rain catches like beads in the folds of the pleated, softly hairy leaves. Spring to fall. 24 in. x 30 in.